Barclay Custom Homes enters the 2001 Parade of Homes™ with a stunning three-story Mediterranean design that offers its residents approximately 5,400 square feet of stunning living area. A graceful circular driveway leads visitors to the striking four-bedroom, 31⁄2 bath, three living area residence. Situated on a lush home site dotted with oaks and elms, stucco columns surround the exterior of the design. Its intricate detailing is highlighted by romantic cupolas and ornate quatrefoil windows, while the rich brown hues of the stucco exterior are complemented by the coppery-brown tones of its barrel tile roof. Impressive twin-towered cupolas flank the Mission-inspired entry, where side niches add more architectural interest. Once inside, visitors will be enchanted with the airy and open design of the foyer, as well as the living and dining areas that are separated by graceful archways and faux stone columns. A glance upward affords visitors gorgeous views of the impressive faux-painted dome ceiling that soars to the upper level. A gently curing spiral staircase with iron handrails hugs one side of the wood-floored foyer and seems to float upward. Tucked beneath the staircase, another spiral stairway leads below to the enchanting atmosphere created by the 17’ x 18’ naturally chilled wine cellar that showcases Cantera-like stone walls and wine racks. The visual impact of the formal living room is heightened by the oval, concave, faux-painted ceiling that is supported by commanding columns. The inviting room offers tranquil views of the backyard’s pool and cabana. An extremely spacious family room is located nearby, made up of more voluminous by it two-story multi-coffered ceiling and the two-story windows that soar high above. A rough-hewn limestone fireplace with built-ins commands attention in the corner of the inviting room. The luxurious kitchen is sure to draw oohs and aahs. Large windows grace one wall, letting an abundance of sunlight stream inside. Positioned in front of the windows is a design element that is truly memorable—a highly unique cabinet constructed of glass which allows the outside light to dance in the glassware displayed within. The room’s custom cabinetry is accented with carved corbels, and its massive center work island is fashioned to resemble a finely crafted piece of furniture. Underfoot, eye-catching 18” x 18” porcelain slate tiles grace the floor, while 12” x 12” tiles create a diamond design on the backsplash. For the ultimate in privacy, the master retreat and adjacent study dominate one side of the spacious plan. Eight-foot doors open into the roomy bedroom, where a wood fireplace accentuates one wall in the cozy sitting area. An equally roomy master bath is made all the more elegant with a domed ceiling accented with cove lighting for added ambiance. On one side of the room, steps lead to the oversized oval tub. 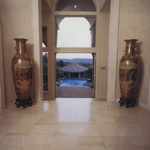 One the other side, bold columns form an entryway that leads into the walk-in shower roomy enough for two. 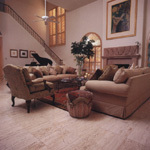 Four sizes of tumbled slate, softened with rounded corners, grace the floor, creating an intricate cobblestone effect. In the adjacent study, stately judge’s paneling adorns the walls. Don’t miss this getaway’s unique paint application on the coffered ceiling’s beams and crown mouldings—it very realistically takes on the look of rich leather. At the top of the spiral staircase, visitors’ eyes will be drawn upward for a closer look at the entry’s domed ceiling. The upper level features the home’s game room, as well as a home theater, and the residence’s secondary bedrooms and baths. The spacious game room is set for fun and recreation with its own billiard and foosball tables, as well as a fully equipped cinema bar. Elegant double doors open onto a large covered balcony that looks out onto the grounds below. When approaching the authentic-looking home theater, get ready for a genuine theater experience. Decked out with a “concessions stand”, complete with popcorn machine and marquee announcing the theater’s offerings, the area is appointed with the two rows of leather reclining seats that beckon with their comfy look. The subtlety of wall sconces and a blinking twilight ceiling put the finishing touches on the nostalgic atmosphere, while a romantic Juliet balcony completes the creative environment. The Barclay Custom Homes philosophy is built on trust and communication. Frank Kerno, owner of Barclay Custom Homes, believes that developing a one-to-one relationship with the customer is the key to the success of each home he builds. "Every customer you meet is different," Frank said. "Every one of them has their own unique way to understanding things. So you have to listed to them, and to their ideas for their home. Not until you understand what they want can you lead them in the right direction." Frank sees his job as a builder is to create reality from the customer's concept or vision. It is this aspect that makes each project he undertakes exciting. "I can take a piece of raw property--land that looks just like any other property anywhere else in the world--and turn it into something unique," Frank said. "Building a house is like crating life--a house has life to it, and in it." Frank's pride in his work and dedication to his client is evident in his own personal definition of a custom home. "My definition of a custom home is not a home that is bigger and fancier than other other, or has a higher cost per square foot," Frank said. "My definition of a custom home is the home the client wants--whatever the client wants. "Mainly," he added, "the cost is what is custom. I spend more time getting the price down for the client than adding custom feature that would bring that price up." When asked what is unique about his homes as compared to the homes of other builders, Frank's answer was short and to the point: "Nothing. All my homes are uniquely different to each other," Frank explained. "If I put a similar feature in all my homes, they wouldn't be custom." Frank also believes in educating his clients, so there are no surprises or misunderstandings during construction. "Before a client spends a dime with us they learn about the building process," Frank said. "We have information pamphlets, brochures, and how-to sheets that explain each process--from financing, liens and warranties to specifications and insurance--because the construction of the home is actually the easiest part. "After the project is complete, the trust that is built through communication and information continues by ensuring the quality long after the home buyer moves in. This is accomplished with a 10-year Home Owners Multiple Equity (H.O.M.E.) Warranty. This warranty program certifies qualifications of the builder's financial stability and of his construction. With the H.O.M.E. Warranty, clients are guaranteed inspections will be made even in areas that don't require those inspections. The home gets an actual insurance policy to back up the builder's guarantee-even if he goes out of business." Although Frank includes the warranty with each home he builds, he has not had a claim against it in the 11 years he has been in business, and he encourages prospective homeowners to call them to check him out. "The average person that buys a home does more research on buying a toaster than he does on finding a builder," Frank said. Frank also encourages clients to check his standing with the Better Business Bureau, former clients, and professional references. He even gives prospective homeowner a list. "It's my business," Frank said. "I don't have to hide behind the veil of a corporation. We've been in business more than eleven years and I'm personally responsible for anything that happens to my company. Like they say, 'The buck stops here,' I have to take care of it, and I do. May companies with up with lawsuits because of mistakes and miscommunication." It is this integrity and attention to detail that has led to the success of Barclay Custom Homes in a business where success is determined almost entirely be referrals. "Referrals are 90% of your business," Chuck Daye, sales director for Barclay Custom Homes, said. "The only way to get a good referral is to get into building it right the first time according to the client's specifications. Our ability to have a one-on-one relationship eliminates any possibility of a communication breakdown between builder and owner." Frank Kerno, a graduate of Rutgers University in business management, started out in the construction industry with one of the nation's largest home building companies. He rapidly advanced to vice president, and was exposed to various types of home building methods. From track to mobile to custom, running these operations incorporated experience in mortgage financing, land development, personnel development, and financial management. He soon formed Barclay Custom Homes, and has successfully built for customers in San Antonio and surrounding Hill Country areas since 1987. In 1992, he brought his brother Ken Kerno in as a construction supervisor, ensuring a continued concentration to customer service and quality construction. 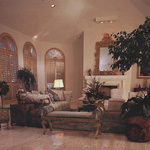 Barclay Custom Homes stresses attention to detail and quality. On-site supervision of all work by the builder guarantees attention to details! The company is based on the ability of the builder to provide that level of quality by direct communication and continuous review of the project. "When a customer has a question, they come directly to me," Frank said. "Every job is conducted on a one-to-one basis. I'm out at the job site every day." 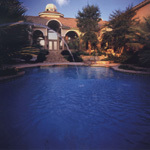 Barclay Custom Homes builds in all areas of San Antonio and the Hill Country. Their homes start in the low $100's and go up to over $1 million. Although most of their homes begin as a client's idea, their office on San Pedro houses thousands of floor plans from all over the country; and Frank and his team keep a running tally of all the available lots in town.